Successfully Added Bluetooth Sports Watch - Pedometer, Calories Burned, IP67 Waterproof, Bluetooth 4.0, Social Notifications (Black) to your Shopping Cart. The EX16 Bluetooth sports watch considerably is one of the best outdoor watches for anybody that occasionally loves to leave their busy city life behind and heads into the wild. Thanks to its waterproof design, this Bluetooth smart watch can be used virtually anywhere. Whether you’re simply taking out the dog for a walk, take a demanding mountain bike ride, or set off for a week-long trip in nature – this Bluetooth outdoor watch will follow you anywhere. Its abundance of outdoor features includes an altimeter, stopwatch, and automated calendar. Additionally, it also supports a highly accurate pedometer that keeps constant track of the distance you cover, steps taken, and the calories burned during your upcoming hikes and workouts. With all this valuable information at hand, you’ll be able to personalize your upcoming workout sessions exactly to meet your future exercise goals in the fastest and most efficient manner possible. A sleep monitor is furthermore in place to make sure that you’ll get enough rest in between your sports sessions – stimulating fast muscle growth and recovery. Supporting Bluetooth 4.0 connectivity, this outdoor Bluetooth sports watch can be efficiently paired with the majority of iOS and Android smartphones. When synchronized with the dedicated mobile Application, this smart watch is capable of displaying messages, call, and social media reminders on its sophisticated 1.1 Inch LED display – ensuring that you’ll never miss out on an important updated again. Increasing your overall user experience even further is its remote camera feature that allows you to operate your smartphone camera from afar – perfect for making group pictures while out with all your friends. 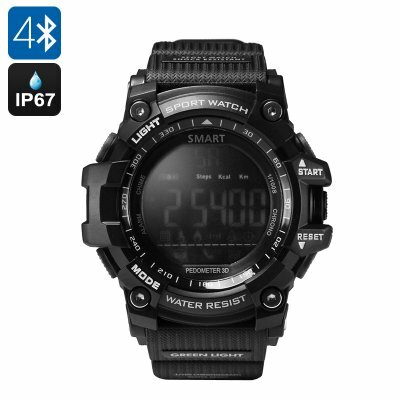 This Bluetooth sports watch comes with a 12 months warranty, brought to you by the leader in electronic devices as well as wholesale electronic gadgets..